Our lead product candidate, entering Phase 2, is LYR-210 for chronic rhinosinusitis (CRS). 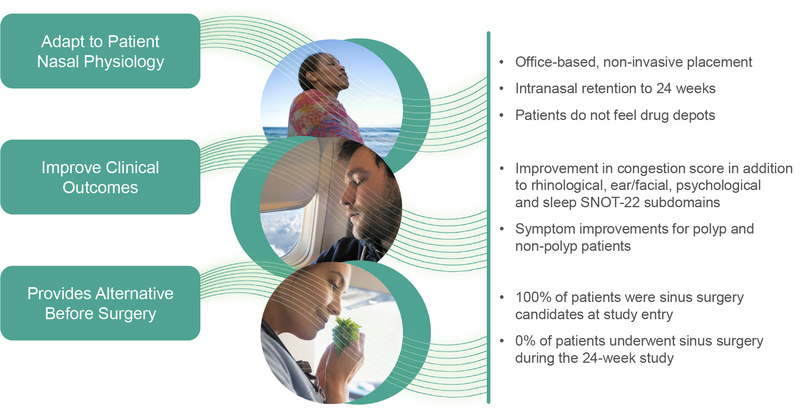 Lyra’s lead product candidate, entering Phase 2, is LYR-210 for chronic rhinosinusitis (CRS), an inflammatory disease of the nasal passages. LYR-210 is a proprietary therapeutic that uses Lyra’s transmucosal therapeutic system to deliver a custom long-acting formulation of mometasone fuorate, a proven steroid, deep into the sinonasal tissue. LYR-210’s unique therapeutic properties enable it to address the challenges of CRS. Clinical results evaluating LYR-210 in CRS patients have shown LYR-210 to be safe and well-tolerated and demonstrated significant improvements in clinical outcomes in patients with CRS. LYR-210 has the potential to be one of the first approved drug products for CRS and is the only product in development offering six months of continuous drug therapy with a single administration. For a summary of the results from the Phase 1 clinical study of LYR-210 in CRS, please see the announcement of the clinical data at the American Rhinologic Society Annual Meeting in October 2018.